Valley Rovers v Bantry played in the West Cork league on Saturday last, in what was a most beautiful day in the sun below in the West Cork venue. Bantry were the overall winners but the Valleys girls played some very good pass & go football which didn't reap the rewards it deserved at times. In the previous game in this league Bandon defeated the girls in a hard fought battle in Brinny where they eventually won out by 4 points. Valley Rovers 4 - 07 Kinsale 6 - 13. Valleys Rovers were beaten in the West Cork ladies u16 semi final played in Brinny last night, Thursday 13th Aug.
Rovers started well in the first half playing attacking football and with the assistance of a slight breeze took the game to Kinsale. Rovers had been beaten by Kinsale in the earlier league stages of the competition but it gulf on that occasion could not be seen last evening. Rovers lead at half time 3 - 06 to 3 - 05, giving the eventual winners a scare. On the restart of the second half Kinsale started to create and more importantly take more chances than Rovers were getting and went into a lead which Rovers couldn't peg back but never gave up fighting to the end, finishing strongly albeit too late. They gave a great display of heart and determination and now take this massive improvement into a county competition coming up in a few weeks time. Team: Emma O'Brien, Adi O'Sullivan, Roisin O' Donovan, Aoife O'Brien, Sarah Lynch, Sarah McCarthy, Carol Cremin , Grainne Dart O'Flynn, Sinead Dart O'Flynn, Jennifer O'Donovan, Emer Kiely,Niamh Hurley, Daire Kiely, Kate Bernard, Kate O'Halloran. Subs: Danielle Murphy, Roisin O'Sullivan, Gywnne Hurley, Aoife Reilly, Kate Murphy, Ellen Fennelly, Clodagh O'Donovan. Valley Rovers U16 team played Nemo Rangers in their opening game of the season (friendly) on Sunday 12 April in Brinny. After a number of weeks training in the Brinny the first game played out very well but unfortunately losing 3-13 to 3-07. 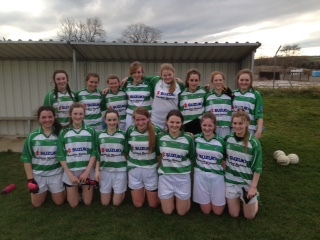 Missing from the photo are Daire & Emer Kiely who played the first half. League fixtures can be seen below. Games will be arranged over the next few weeks. Well done to all the girls & to Chris & Seamus. > Bandon v Valley Rovers. > Clonakilty v Valley Rovers. > Round 5: Play before Aug 2nd. > Semi Final: Play before Aug 16th. > Final: Play before Aug 23rd.